Preheat the oven to 350° and place a rack in the center. 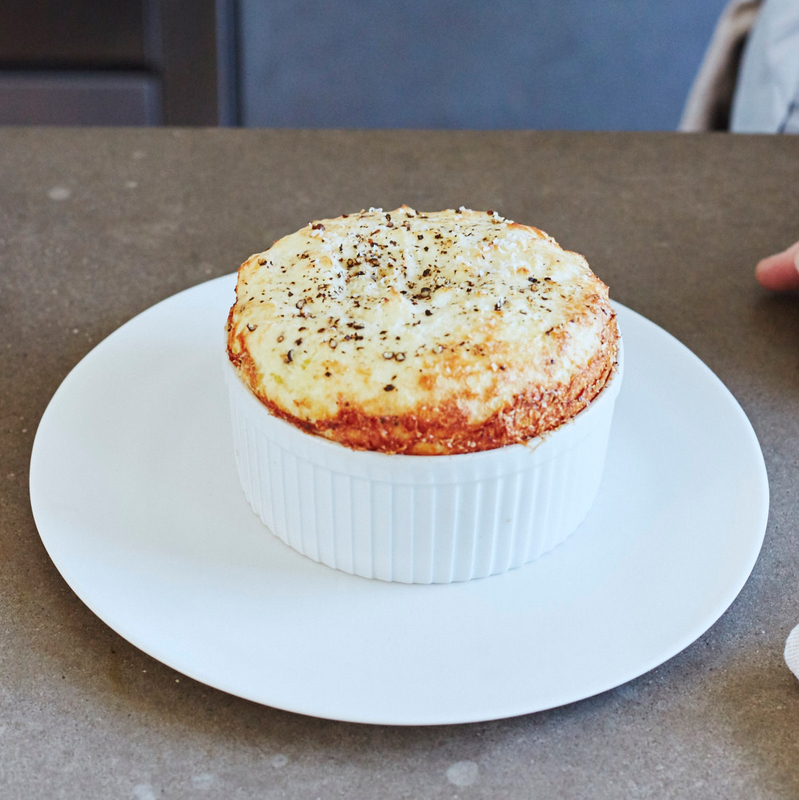 Use the 1 tablespoon of softened butter to grease the inside of a 3-cup soufflé dish. Add 2 tablespoons of the grated Parmigiano and turn the dish to coat it with the cheese. Wipe any cheese off the rim of the dish. Sprinkle the bottom of the dish with black pepper; refrigerate. In a medium bowl, whisk the egg yolks with 3 tablespoons of the flour. In a medium saucepan, bring the milk to a simmer with the remaining 3 tablespoons of butter. While whisking constantly, slowly drizzle the hot milk into the egg yolk mixture until incorporated. Working off the heat, scrape the mixture into the saucepan. Whisk in the remaining 2 tablespoons of flour until incorporated, then whisk in 1 1/2 cups of the cheese and the salt. Cook the mixture over moderately low heat, whisking constantly, until very thick, about 3 minutes. Scrape the mixture into a large bowl to cool slightly. In a medium bowl, beat the egg whites at medium speed until medium-firm peaks form, about 3 minutes. Whisk the soufflé base to loosen, then stir in one-third of the egg whites just until blended; fold in the remaining egg whites until incorporated. Spoon the mixture into the prepared dish to reach three-quarters of the way up the side (you may have some left over). Smooth the top but avoid spreading the mixture up the edge of the dish. Sprinkle with the remaining 1 tablespoon of grated cheese and black pepper. Bake in the middle of the oven for about 22 minutes, until golden and puffed. Serve hot. Pair this dish with a crisp, red-fruited Chianti Classico.